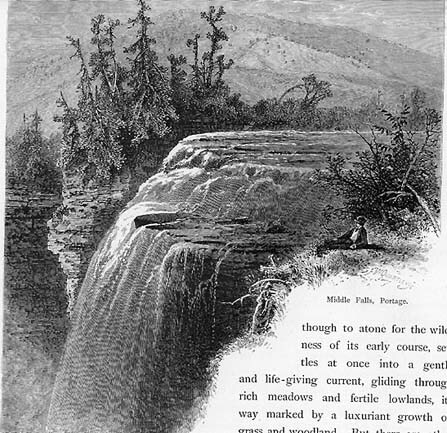 The Portage Images from the "Valley of the Genesee"
Volume 2 includes the chapter on the "Valley of the Genesee". You can read the parts of the chapter relating to Letchworth Park by clicking here. Below you will find copies of the images which went with the narratives. These original illustrations were done by J. Douglas Woodward. Artistic impressions of the Portage area can provide important historical information. Although they are more subjective than photographs, that subjectivity can give us important clues as to how people viewed the area in Mr. Letchworth's time. For example, view the three images below. What important part of Letchworth history has the artist left out? Why was it left out? 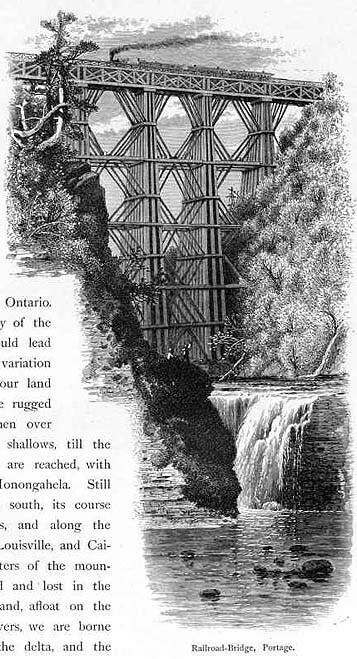 The first drawing shows the Wooden High Bridge towering high above the Upper Falls. 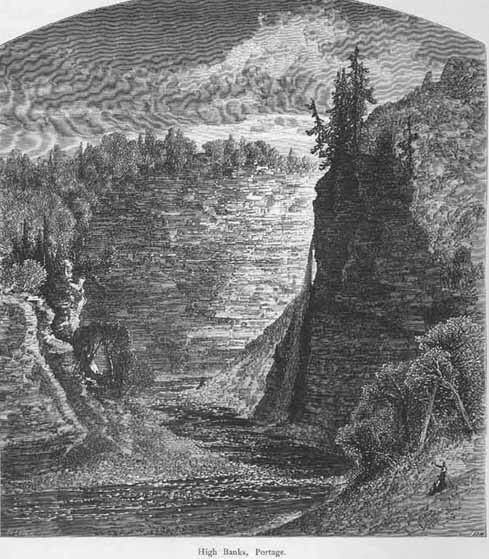 The Middle Falls is shown in this artist's view from the west bank of the River. This sketch was made from the present day Slide Area, just below the Middle Falls. The Falls cascading down from the right hand cliff is the Bridal Veil, while Degayasoh Creek enters the gorge just around the point to the left. What important part of Letchworth history has the artist left out? Why was it left out? Well, look closely at the images. Something very important to the Letchworth story should have been visible in all three sketches - the Genesee Valley Canal! Although the artist included the magnificent Portage Railroad bridge, he chose to "erase" all traces of the Canal. Why? "Picturesque America" wanted to emphasis the natural beauty of the land. The artist accented, and to some extent exaggerated , the ruggedness and vastness of the gorge. The wooden railroad bridge was considered to complement this natural beauty, even though it was a manmade addition to the Valley. Although we would love to glimpse the historic old canal, and many in its day considered it to be an engineering feat - it was considered to be an ugly scar in the beautiful valley. It is said that the original maples that stood in front of the Glen Iris were planted by Mr. Letchworth to hide the "eye sore" the Canal had created along the eastern bank. So the artist, we believe, did what many visitors to the Glen Iris Estate would have loved to do - he made the Canal disappear! What other historical information can you glean from these images?